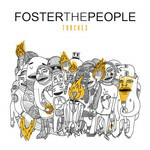 Foster The People (originally Foster & The People)is a young American band from California. Owing to their debut mini-album and particularly the hit Pumped Up Kicks, this formation in a blink of an eye made their way to radio and earned themselves an impressive support any fresher would like to have. A year later after that release, the Americans issued their first full-length studio work, Torches, which was hailed as a big event in the alternative rock community. The problem was that alternative rock is not what characterizes the dominant part of this record, although this is the music many critics and listeners associated Foster The People with. They made the conclusion too fast and too early, and there is nothing weird about that because alternative rock or indie-rock is a very obscure and wide term that embraces easily a great number of various music phenomena of our days. Moreover, Pumped Up Kicks was just something very close to rock music. Those who came to like the outfit for this very song hoped that Torches would be just an extended version of the same music. It was something a little different. Once you hear the opener Helena Beats,you get a sensation or rather a suspicion that somebody at some stage mixed up something, for example, put a wrong CD into the box, or placed a wrong sticker on the CD itself. Either way, this song, loaded with classic yeah yeah has little to do with the following hit Pumped Up Kicks. As a matter of fact, the only piece on the record that musically reminds of this song is Waste, located in the center of the CD. The remaining part of Torches is electronica bearing a strong resemblance to MGMT, with high-pitched vocals sometimes reaching so high that it makes it almost impossible to make out the lyrics. Some of the tracks are truly nice. I Would Do Anything For You is endowed with a genuinely splendid chorus, and Warrant has a piano line that sends shivers down one’s spine. However, even the forty minutes that the album lasts, is enough for one to notice boring or repeating moments. Torches balances on the verge of being a one- or two-hit album, which could be a disaster for any fresh performer. So what is the problem with Foster The People? It is too hard to give out an accurate answer because all the guys from the trio did their jobs in good faith, and if you get down to measuring technical parameters of music, there will be no flaws disclosed. However, after a few listening you will not be able to evade from a thought that the CD simply lacks sincerity. On the one hand, this is so easy to be honest and sing about what troubles your own soul. On the other hand, this is just as easy to fall victim to temptation to present someone else’s thoughts and feelings as yours. The music of Torches seems emotional enough, sometimes cheerful and sometimes sad, but it sounds rather like a soundtrack to meaningless video clips or beautiful images. It seems incapable to reflect the inner state of a person instead. Writing a classy song that would be like a bomb and explode the airplay is one thing, but making a whole album, a big work with something more than just overwhelming emotions and loud words, something with an idea is a completely different story. As we are well aware of great talents and potentials the guys from Foster The People have, we are confident that the band just needs time to grow up and get harder on themselves. This is when they are ready to do something much better.